The Redhound community has had this date circled since losing to the Rebels last year in the 3A state finals. The difference in the two teams, Corbin had to fill the void left by a big senior class, while Boyle County brought the majority of their team back for the 2018 season. The goal for these two programs isn’t to make the playoffs, or win a regional title . . . . Both prestigious programs have hopes of winning a state title. Boyle County, located in central Kentucky, have a history of winning state titles and sending players off to play at the next level. Players like Jacob Tamme, who played for the Rebels, put the program on the map during his high school career. Tamme and the Rebels boasted a 58-2 record over a four-year span winning a state championship each year. Tamme moved on to have a stellar career at the University of Kentucky, which culminated with a First Team All-SEC honor his senior season. Tamme then went on to the NFL where he was drafted in the 4th round by the Indianapolis Colts in 2008 and had a long career and recently retired in 2017. Including Tamme’s four (4) state championships, the Rebels have won eight (8) total. Spanning from 1999-2017. Coaching the Rebels from 1992-2004 was Coach Chuck Smith. Coach Smith won five (5) straight state titles from 1999-2004. In those five (5) seasons the Rebels only lost 1 game for an overall record of 59-1. During Smith’s time at Boyle County, he comprised an overall record of 142-33, and his teams also ranked 2nd all-time in consecutive wins by winning 47 straight. Upon leaving Boyle County in 2005, Coach Smith joined the University of Kentucky Football Coaching Staff as the Linebackers Coach. Nearly a decade later, Coach Smith returned to Boyle County in 2014 to assume the role he stepped away from. Since returning, Coach Smith has brought the Rebels back on top of the mountain culminating in winning the Class 3A State Championship last season over Corbin. Corbin has had their fair share of success stories. Paramount is Hound Great, Roger Bird, who starred at Corbin and then made his way to the University of Kentucky. At UK, Bird was a 2-time First Team All-SEC defensive back. Upon leaving UK, Bird joined the Oakland Raiders in 1966 where he played through the 1968 season and winning the AFL Championship. Corbin’s Head Coach Justin Haddix is familiar with Boyle County. While at Breathitt County High School, Justin Haddix and the Bobcats played against Coach Smith in 2000. Justin was just a sophomore, but was nonetheless on the receiving end of a brutal loss, one of Breathitt’s worst defeats in the program’s rich history. Coach Haddix, as a senior, led the Bobcats to a state championship of his own while breaking several state passing records along the way. Once he graduated High School, Justin started all four years at Western Kentucky University. Haddix got his first opportunity to be a Head Coach at Perry County Central were he took a “basketball school” and made them relevant on the gridiron. Then the Corbin Head Coaching Job came open. Such a historic program in it’s own right, Corbin hadn’t been to the state championship game since Justin Haddix and Breathitt dropped 51 on the Redhounds in 2002. In just a short period of time at Corbin, Coach Haddix has given life to Corbin Football as they have returned to state contenders year in and year out. Last season, the Redhounds made their return to the State Championship game where they faced Coach Smith and the Boyle County Rebels. The game was close throughout, but ultimately got away from the Redhounds late. For a community that has longed for a championship, it was a heart breaking defeat. If any positive can come from the loss it is learning what it takes to become a champion. So the Redhounds went back to work in 2018 with the mantra “Unfinished Business”, knowing that if they wanted to make it back to the State Championship, that this year they would have to go through Boyle County to get there. The goal isn’t to win a regional title, or finish second anymore for Corbin, the goal is to beat Boyle and advance to their second consecutive state championship appearance, and to bring the KHSAA hardware back Hound Nation. This one promises to be an instant classic. The atmosphere at Campbell Field will undoubtedly be electric. 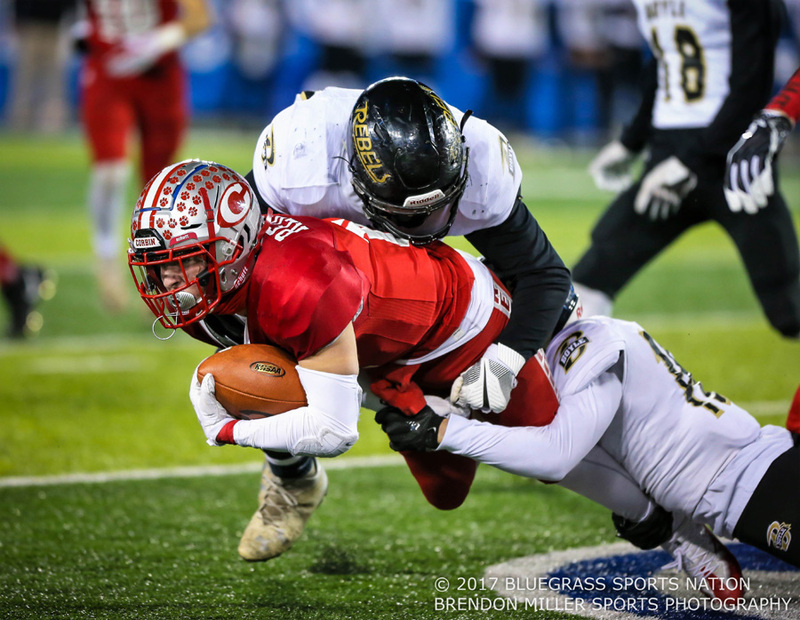 Can Corbin exercise their demons and get to their second consecutive 3A Championship game, or will Boyle County begin Coach Smith’s second dynasty as the Rebels’ Head Coach? Find out this Friday as Corbin hosts Boyle! !